Darn, I was hoping to win. Next year? Have an open mind. This means that if an editor tells you that your story would benefit from a different point of view, or that the three paragraphs you wrote to describe the meal your protagonist had for breakfast should be deleted, consider that you might be too close to the work to see it at its potential best. The choice is always yours to choose or reject an edit, but if you’ve hired a good editor, she knows what works and what doesn’t. Boy have I been busy editing books, reviewing books, and proofreading documents, and I have so much to share with you since I last wrote. My goal in this post is to pass along a few secrets about what your editor wants you to know, and to help you understand how an independent editor like me operates. These four tidbits can ensure an enjoyable relationship for the two of you. I know you’re excited to have finished the first three chapters of your book and you can’t wait to show it to an editor. But first you must finish the book. 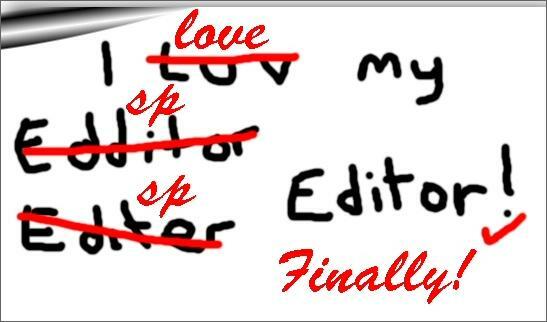 Most editors do not want to edit an unfinished manuscript. It is far better for you, and the story, to receive feedback on a completed work. The editor must be invested in the characters and the plot before commenting on the book as a whole. I take notes on the story as I go, and I often change my mind throughout. I recently edited a humorous novel about a woman who gets hired to write a blog on spirituality…a topic the character knows nothing about. Many of the relationships did not fully play out until the end, so I would never have been able to edit this before reading it in its entirety. The exception to this is if you’re looking for a developmental editor, who will help you create the story as you go along. This entails a collaborative relationship between the author and editor and is more intensive (and usually more costly) than a substantive edit, which is performed on a finished manuscript. It’s important to be clear about what type of editing you’ll be receiving, and to iron out the specifics before your editor begins. Most editors will spell out the terms of your project in a formal agreement. I use a very simple one, but it states the name of the project, the flat rate or per-word rate, the date it will be delivered, and specifications about how additional work will be handled. I used to differentiate between types of editing, but I have since changed that to a “whatever it needs” approach because I have found that this best serves the author. However, flexibility reigns, always. I also always ask authors if there’s anything in particular they would like me to pay attention to while editing, such as the ending, the pace, a particular character’s motivation, structure, or any number of things. Give this some thought before hiring an editor. 3) You Want Me to What? When your editor returns your finished project back to you, by all means ask questions if you have any. You might need more clarity on why he deleted a certain section or why he asked you to expand another section. The editor should provide you with detailed notes, but if anything is fuzzy, ask. It is not the editor’s job, however, to go back over the entire manuscript after you have made all the changes. That is almost another full manuscript edit. Your editor would be starting from scratch again with all the new changes, and would have to charge accordingly. The exception to this is that you might want to hire a copyeditor and/or proofreader to check the sections you changed. I offer to do this at a reduced rate. 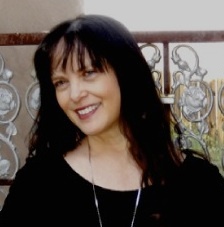 I also offer my authors a “manuscript evaluation” service, which is not an in-text edit, but an in-depth analysis of the work, including detailed commentary on plot, characterization, flow, etc. Some authors opt for this, then make the necessary changes, and then come back to me for a full technical edit at a much-reduced rate. This is an ideal situation because it gives the author an opportunity to fine-tune the work before doing the technical edit, which should come after the manuscript is mostly intact. It also allows me to read the manuscript again, which can give me deeper insight into the work. And it saves the author money. The author-editor relationship, like any other, is two-way, so both should respect the other’s time. I often handle editing projects strictly by e-mail, but if an author wants to speak on the phone, I am more than happy to do so. Some authors take this as carte blanche to treat me like a friend they’d have lunch with, where they discuss everything from politics to Lindsay Lohan’s latest imprisonment. I am very phone-friendly and love getting to know my authors a bit, but time is money, and I often need to cut conversations short when they stray too far beyond the scope of the project. I don’t mind a question or two about the publishing field in general—should I self-publish, or try to get an agent?—but it’s not appropriate to engage your editor in prolonged discussions about the publishing industry. Keep the conversation (and the e-mails!) about the project at hand. And be mindful not to flood your editor’s inbox. She is being hired to edit your work, not provide you with a crash course in publishing. 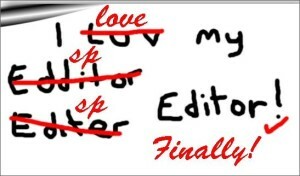 My next blog entry will help writers gain even more favor with their editor! I figured it would be so predictable to blog on NGD, so I didn’t. Sometimes, just for poops and giggles, I tap into my inner New York voice. (I’m allowed to; I grew up on Long G’island.) So, my husband and I were talking about National Grammar Day, ’cause we’re both word geeks, even though he at least balances that by being a veterinarian. I was telling him how, in junior high, we wrote letters to our friends during homeroom and study hall, and I distinctly recall saying I had a gramma test coming up. I think we actually believed that was how to spell it. I got a job reviewing books for Kirkus, even though my husband keeps calling them Birkus. I am loving it and it feels fan-freaking-tastic to be in company with some of the best book critics in the world. When I first got the job, my ego ran for the toilet, but it has emerged (I had to clean it off a bit.) I’d love to hear about your favorite places to read book reviews. Mine? NY Times, Kirkus (! ), and Bookmarks Magazine.